How to become a Professional Knitter - Robin Hunter Designs: Does Price equal Quality? She was very disappointed in my yarn choice. We didn't get a chance for a full discussion but I did leave thinking it was an odd reaction since initially she was very complimentary when she saw the garment. I may have misinterpreted but it appeared my yarn choice just wasn't upscale enough for her tastes. It also seemed a little strange since 100% worsted weight wool seems to me to be one of the very easy substitutes. I used Wool of the Andes Superwash however, when I was asked, I forgot to say it was the Superwash so I know that wasn't the reason. I know many knitters don't like Superwash but I do. I like it's softer hand and drape. I've never had a problem with the growth issue I read about on Ravelry. I will say, I do squeeze out most of the moisture with a towel before I handle the garment to avoid stressing and stretching the fabric. I expect that the yarn snob factor does play into to our yarn choices (mine included) but my experience is that price does not always equal quality. Price is what the market will bear. So for comparison sake here's a few equivalent yarns and their prices. I've adjusted for put-up size basing everything on 50 gram balls. I used only Superwash in the examples because it is more expensive than non Superwash due to the extra processing. I used prices in US dollars. I found the equivalents on yarnsub.com. 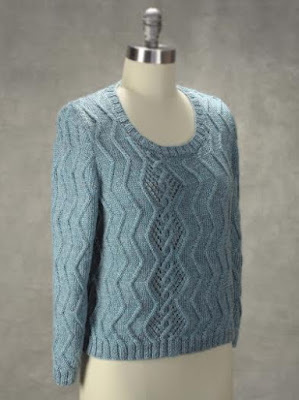 When you multiply prices over the cost required for a whole sweater this can be significant and of course the size required has an impact as well. I realized when I created this list my own preconceived ideas played into my assumptions. I expected the Rowan to be the most expensive and it is. I thought Brown Sheep was a lower end product, yet it is the second highest price. I have a friend who loves the Ella Rae line and who is very focused on quality so the lowest price on the list was a surprise. I'm realizing that the only way to truly compare is with hands on experimentation. All the other yarns come from a manufacturer before landing at the online sites where I took prices from. The Knit Picks model skips the intermediate step with yarn which accounts for their lower pricing. Labels: # knitting blogs, Does Price equal Quality? I love KnitPicks! They provide wonderful products in an affordable price range. Their customer service is excellent, so what's not to love? In the interests of full disclosure, I have NO affiliation with them whatsoever except that of a satisfied customer.